How Do I Use My Scraperite?? 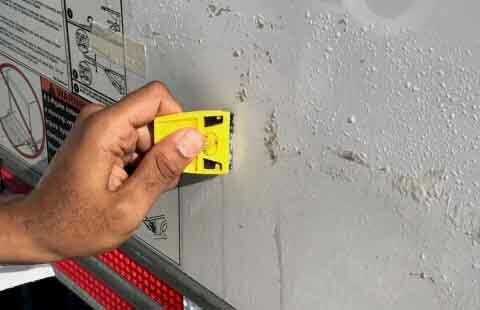 ​​Plastic razor blades are such a handy little tool, but where can I use them? Well, there is no one correct answer - there are so many different ways a plastic razor blade can be used, on a plethora of different surfaces. There are even different types of blades depending on what surface you're working on - wood, metal, glass - the possibilities are endless! We reached out to some experts on "scraping" for a great example of where to use a plastic razor blade. One of the most common and easy uses for a Scraperite is on glass or a painted surface, much like the curved exterior of your car. Studio Graphics in Canada put our blades to the test while removing graphics from the surface of their automobiles. Using a fluid scraping motion, you can see how the leftover sticky adhesive is easily removed from the surface without any damage. In this particular case, using a standard adhesive removing chemical, like alcohol, in conjunction with the blade proves to be the most efficient method - similarly for other surface/substance combinations. ​Studio Graphics uses these blades confidently on their automobiles because they know there is no risk in scratching the underlying layer of paint when replacing and removing any graphic. Eliminating this risk gives the users confidence in the investment in the blades, rather than replacing a damaged surface. Scraperite double-edged plastic razor blades are great for scraping and cleaning wherever a metal blade would be inappropriate. 29 September 2017 How Do I Use My Scraperite?? Removing Pesky Gum from your Carpets?